When you traverse the roads less travelled there is so much more to see. 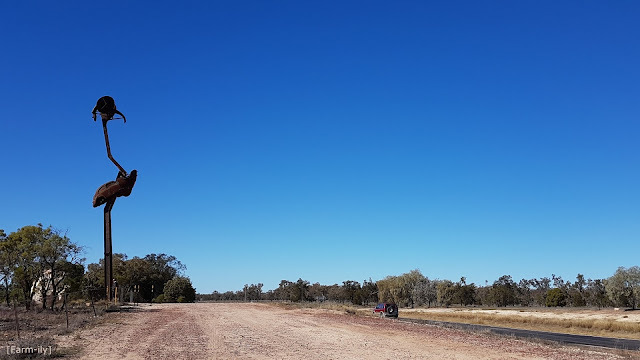 Over the last four blog posts I have showed you the landscape and incredible beauty of outback New South Wales & Queensland. Today’s post is the last one about our travels and it is dedicated to the colourful and creativeness of the residents of these areas. Without their “out of box” thinking none of these artworks would have got off the ground. I love that rural towns find their identity and bring it too life through sculptures and murals, some on a very grand scale. 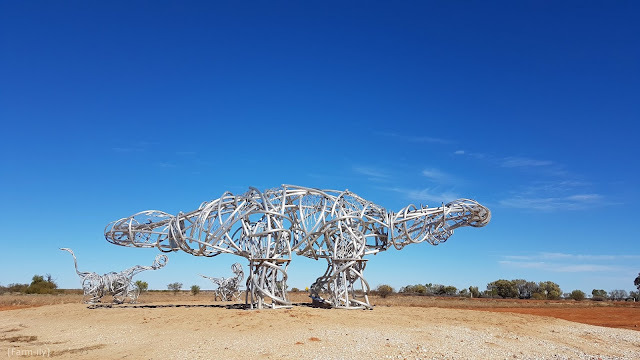 This is Stanley, an emu designed by John Murray who welcomes drivers into Lightning Ridge, NSW. He stands 18m (60ft) tall and his body is made from a VW Beetle. The Knot-a-saurus is found in the remote town of Eromanga, QLD. 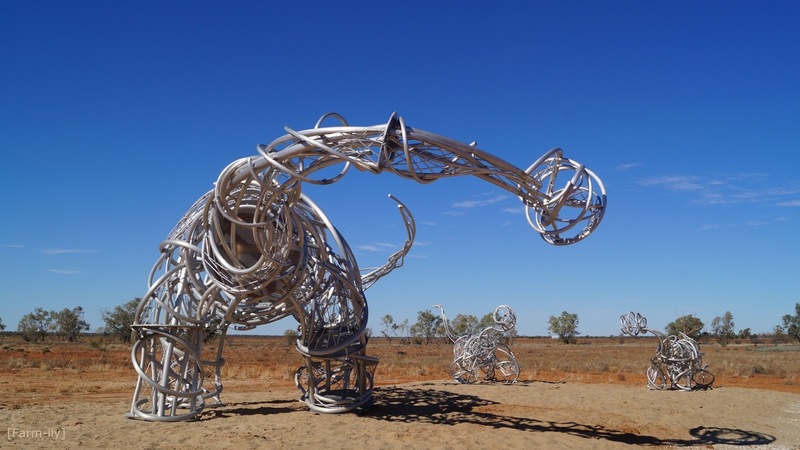 It was commissioned to be part of the 2014 G20 Summit in Queensland and then gifted to Eromanga Natural History Museum. Maybe you need to see it from this angle to get the full understanding and scale of this sculpture. Dinosaurs I hear you thinking? Yep! This was an amazing place to visit. Significant paleontological discoveries of Australia’s largest dinosaur “Cooper” a Titanosaur, were made on a property not far from Eromanga. Cooper is estimated to be over 95 million years old. The work that these people are doing is unbelievable, chipping away millions of years of dirt to reveal dinosaur bones, one millimetre at a time. The process is painstaking and extremely time consuming, but fascinating to see and well worth a visit. 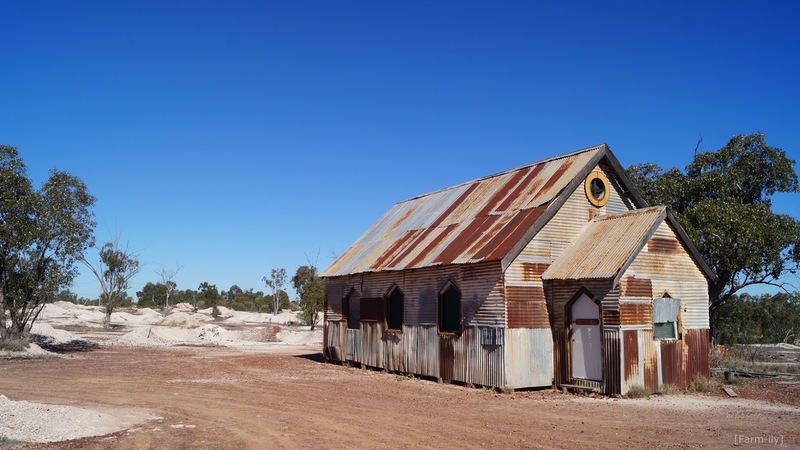 The very quirky Corrugated Iron Church is in Lightning Ridge, NSW, an opal mining town. This church was built in 2000 for the movie “Goddess of 1967” and was subsequently purchased privately for it to remain in the town. Clancy Stops the Overflow by Peter Mortimore. 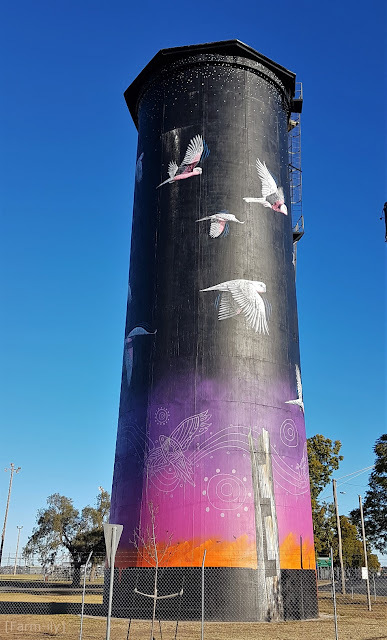 The newly completed painted water tower in Coonamble, NSW. A huge 26m (85ft) high mural by John Murray, Bob Barrett and Sooty Walsh finished July 2017. 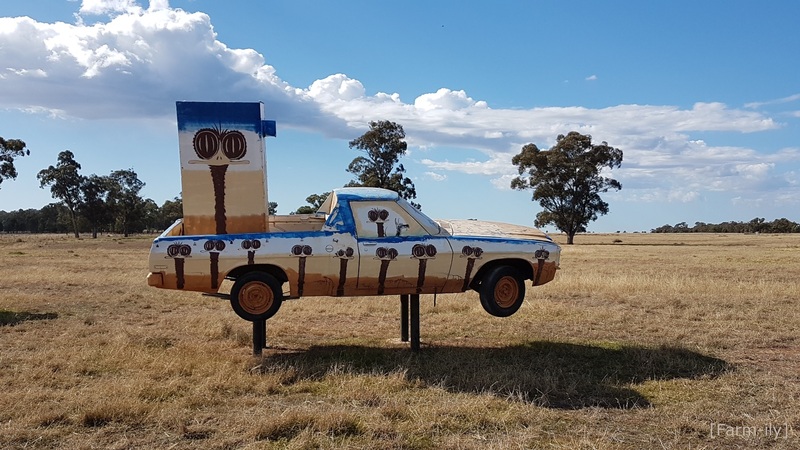 It really stops you in your tracks as you are driving through Coonamble with its colourful beauty. And last, but certainly not least the Weethalle Silo Art Project. This was only finished a couple of weeks before we arrived. This breathtaking mural was painted by Mongolian-born muralist Heesco Khosnaran and measures 31m x 21m (100ft x 70ft). It is spectacular! The detail in such a huge mural is incredible. The idea of decorating silos, which store grain, with artwork is likely to continue across rural Australia after successful projects in both South Australian & Victoria through The Silo Art Trail. 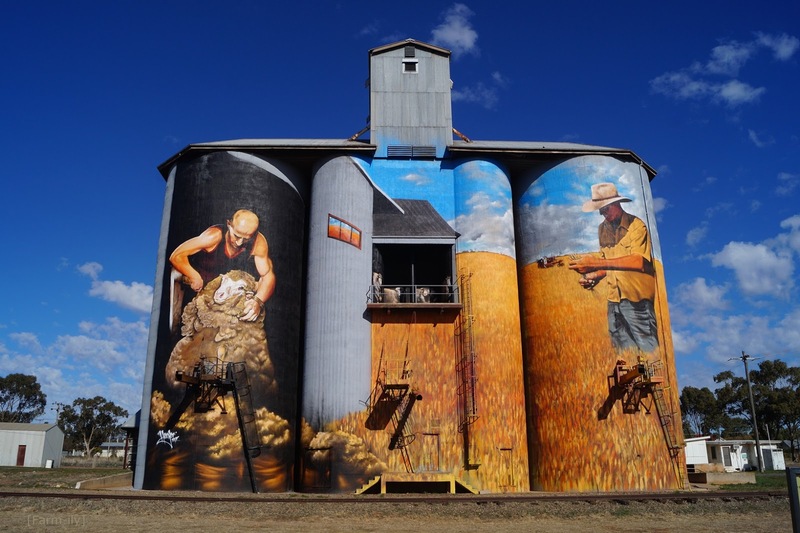 These huge murals are drawing tourists to small rural towns that are otherwise doing it tough. The flow on effect of tourists to those communities is huge. And so ends our journey. 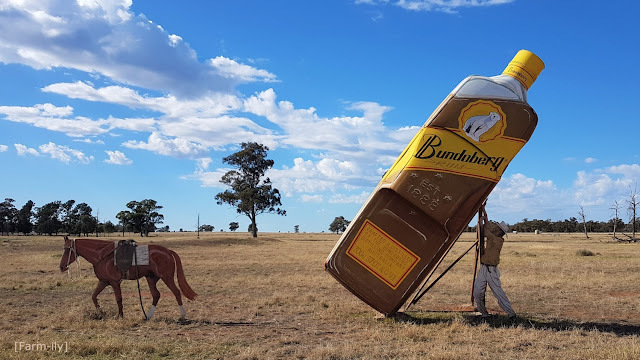 I really hope you have enjoyed your look around some of outback Australia and it inspires you to take the road less travelled when you are planning your next holiday... in whichever country you are. Loved them all - and hope that the decorated silo projects take off. What an absolutely magnificent (and I use the word with care) set of pictures with which to end your (and our) journey. Thank you. Now I've caught up and it's time for morning coffee. Glad you enjoyed the journey Graham. Just brilliant photos and how good are the silo mural projects. We met Peter Browne in the Adelaide town of Hahndorf in the the early 1980s. He told us, my name is Browne and I paint in brown. We bought one of emu paintings, yes, he has been doing the same emu style for many years. While we really liked the painting and still do, it is now under a bed as it does suit our current place. I had it valued a few years ago and it wasn't worth very much more than we paid for it, inflation taken into account. One never wishes anyone to die, but......his work is quite unique and I suggest undervalued. It is great to see a Emute and know he is still working. Of all the painted utes at the Utes in the Paddock Emute was one of my favourites. I love the quirkiness of the emus that Peter captures. 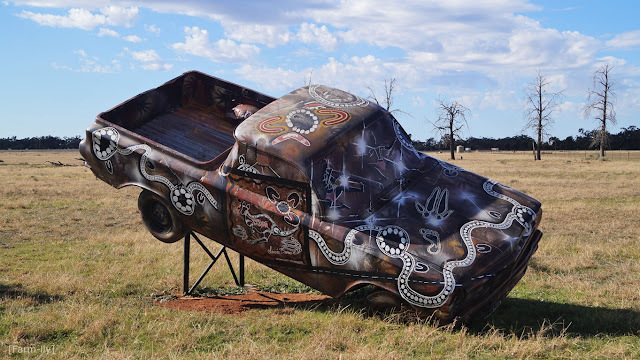 He is based in the Southern Highlands and has a gallery at Berrima. You should put that on your to do list! So much creativity and talent out there. The silos are brilliant. You can almost see the sheep moving in the barn. That is a very colorful and eye catching area to tour. All of these are fantastic--- both the subjects and your captures. Thanks for this great post. That is so very interesting. What a great idea to decorate silos and water tanks.I love that idea. Oh course you love the water tower!! It is the home town favourite! Mind you I do have to agree with you. It is awesome, so colourful and cheery. Oh, my....I sure enjoyed these...I don't know which I like best. It would probably depend on the day I look at them. Love the murals painted on the silo. I love all of these murals !!! !